All Products essential for professional discounters. 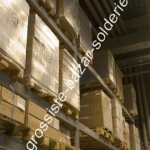 Our net price is only 199 € / pallet, with a minimum of 30 pallets or a full truck or container. price with possibility of delivery to any destination. For a complete set, your purchase price is only 5970 euros HT is a semi-trailer truck, less than 10% of the retail price.